Jennifer's parents, Robin and Jeff Briggs, stand with Dylan Johnston, who was the recipient of the Oklahoma City Community scholar. 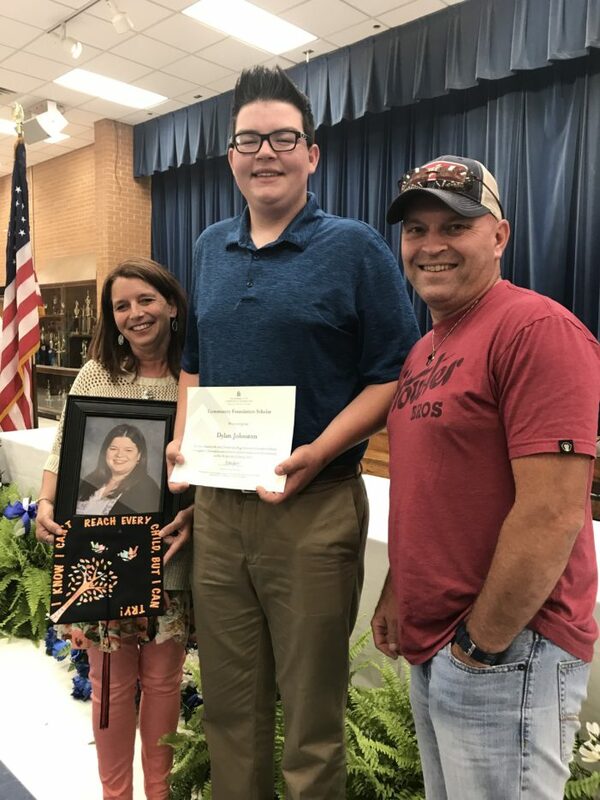 A Guthrie High School (GHS) senior was presented and awarded a scholarship in the memory of a teacher, who was tragically killed in a vehicle accident. The award was given at the annual GHS Scholarship Awards presentation. Dylan Johnston was the Oklahoma City Community scholar, who was the first to be awarded a $2,000 scholarship in Jennifer Briggs’ memory. Johnston plans to pursue a degree in mechanical engineering. The Jennifer Lea Briggs Scholarship was created by Jennifer’s family to honor Guthrie High School students who, preferably, plan to attend Oklahoma State University with a degree in education. Jennifer, along with Heather Wilson, were both killed on Oct. 27, 2014 on Highway 33 on their way into Guthrie from Stillwater to teach at the Guthrie Junior High School. Guthrie schools have a long legacy with Jennifer’s family going back to her grandfather, Kenneth Mitchell, who graduated from Guthrie High School and served on the school board for many years. Jennifer’s mother, Robin and maternal aunts and uncles also all graduated from Guthrie. Interested parties can get more information about how to apply for the scholarship or to make donations by contacting the Oklahoma City Community Foundation at 405-235-5603.